(Editior’s note: From time to time we welcome guests to contribute to Photofocus. Lauri Novak, like many of us, began making photographs at a young age. Words she lives by are; play, seeing, live and love. Welcome to Photofocus! Lauri Novak. So many of us feel like we need to have the latest and greatest gear to get the images we want when in fact a lot can be done with what we have. I was given this shoot as an assignment four years ago and it taught me a lot. This was shot with my first DSLR and a used lens I purchased from a friend. I did not own any lighting equipment, umbrellas or even an external flash at this point. 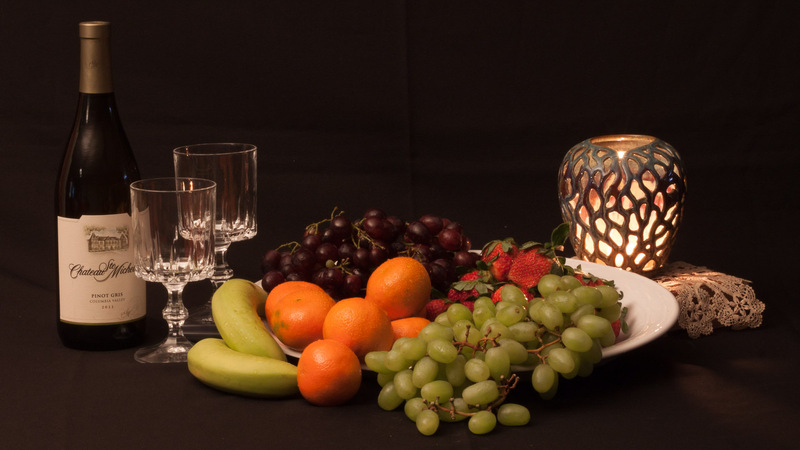 The assignment was: Create a technically sound classical still life photograph. It can be whatever you want, but it must be spot on when it comes to lighting, focus, composition, etc. I never used to edit my photos at all. Period. I’ve learned over the last few years that editing can bring out more of what our vision for an image might be, or that it can be just for fun, but it’s not always needed. In the end, you have to take a good shot to begin with; focus, composition, lighting and all the elements that go into a good photograph should be there first. It helps tremendously to really know your camera. The final image was shot with a 50mm f1.8 lens because I knew that was my sharpest lens, 100 ISO so I would have little to no noise, f22 to help with lighting/DOF (started out at f5.6) and a 30 second exposure for the final shot (my basement has no windows and not great light). Are there better ways to have shot this? Of course there are, but at that time, in my basement with only a desk, floor, and overhead lights I made it work. Moving lighting around to eliminate shadows. Here are a couple shots of my set up as well so you can see that you don’t have to have fancy equipment to make this happen. I have a basement, a non-reflective piece of material, desk lamps, tripod & camera. That’s it. It’s not perfect (the crease in the fabric in front of the grapes is making me crazy) but it just goes to show, you don’t always need expensive equipment or a studio to make things work, you can make it work with what you have. Doing assignments like this, limiting yourself with what you have, using only one lens when you go out to shoot, and challenging yourself in unfamiliar situations are all ways of pushing yourself and learning more about all the elements that go into a good photograph. What’s more, you get to learn your camera’s capabilities in the process and practice thinking creatively. Lauri Novak is a fine art photographer, traveler, wonderer, and wanderer: inspiring and challenging you to see the world in new and unique ways. You can find her on Instagram and at Lauri Novak Photography. Well thought out and written. It makes me want to grab a camera right now. Well we like to be able to pay our bills and the staff. We offer site subscriptions without ads if people want them. Thanks so much Ted – hope you did get out and get some shooting done!